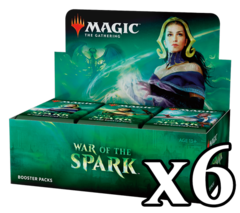 War of the Spark booster case contains 6 booster boxes. Each booster box contains 36 individual booster packs of 15 card each for a total of 540 cards. Each and every War of the Spark booster pack contains at least 1 Planeswalker card!